Home > Sourcing Art > Art Fairs, What are they? Art Fairs are trade style sales events, held (usually) under one roof. They can vary greatly in size and in focus, from small local events, based around amateur arts groups, to international events such as the Venice Biennale and the Frieze Art Fair in Regents Park, London and Documenta in Germany. Art Fairs are a great place to both buy and sell work with stalls and partitioned gallery areas often being reasonably priced enough to allow profit to be made. At larger fairs, which are more exclusive and expensive, less established collectors can stand to do good business at fringe events. Larger art fairs have become the place to be seen and are essentially networking events for galleries from across the world. The Venice Biennale (established 1895) is the largest festival of its kind, housed in 30 pavilions that each represent a nation. The whole Biennale itself is presided over by one curator (or a group of curators) who change every Biennale. The size and scope of the Venice Biennale make it a great occasion for artists to gather, many of which are from nations under represented in the artistic field. Documenta (sometimes referred to as the 100 day exhibition), held in Kassel, Germany, was established in 1955 and takes place every 5 years. Since ‘documenta 5’ held in 1972, documenta has been considered as a forerunner of cutting edge art. Its 5 yearly format allows organisers to gauge the mood of the time and present challenging forays into new artistic territories. Documenta goes far beyond the remit of a straightforward art show, presenting a strong art theory element alongside the display of artworks. Documenta 12 Magazine (from 16/06 to 23/09) includes contributions from 90 magazines and online journals – a total of 300 artists and writers contributions, which will be selectively presented over 3 issues. Documenta is more than just a trade fair – it aspires to a social ideal, as it aims to bring the voices of artists and theorists together from across the world. The Frieze art fair began in 2003 and has been held every October since. It has fast become one of the largest art fairs in the world, and has a very market-oriented focus. However, with the clamber for sales purchases a strong fringe element, an ethos akin to that of the Venice Biennale and documenta (promoting international artistic co-operation) has developed. Every year, a charity fund (‘Outset Contemporary Art Fund’) made up of tens of donors collude to raise money for Tate Modern to buy new works from the Frieze art fair. In 2005 the fund raised a total of £125,000 benefiting the Tate public collection and emerging artists. 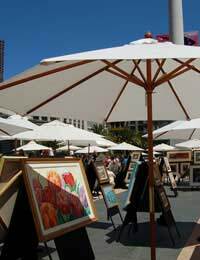 Smaller art fairs range from fete style presentations of a local water colour clubs collected output (for example) to affordable art fairs of upcoming artists works. These fairs are well worth a look whenever the opportunity arises. A large number of established galleries and collectors will tour many of the lesser fairs where both stall prices and purchase prices will often be cheaper. Ones to watch out for include ‘Knit and Stitch’ (Alexander Palace, London, for textile based art), The London Art Fair (Business Design Centre, Islington).